Espresso Martini Cocktail with Mexican Arabica Coffee: A British Style Cocktail with the Sparkling Taste of Mexican Arabica Coffee. In the multicultural environment that we live in today, why not try a famous British cocktail inspired by a famous Italian ristretto coffee, vodka which comes from the Russian culture, and made with Mexican Arabica Coffee? It’s a good opportunity to mix flavours, styles and cultures that will enrich our daily lives, open our minds and enhances creativity. The Espresso Martini will also cheer you up, and give you the energy you need either to continue with your daily duties or enjoy a long night with friends! The Espresso Martini is a popular drink made with vodka and coffee. This delicious coffee drink originated in the UK more than 3 decades ago. As the story goes, this cocktail was tailored for a young model some decades ago who visited a popular bar in London. She ordered a cocktail that could wake her up and cheer her up at the same time. This drink was created for her and is now one of the most famous drinks worldwide. 4 roasted coffee beans of Mexico Real Cafe to decorate the glass. Use 8g of ground mexican coffee (Mexico Real Cafe) and 25ml of water to make a ristretto coffee. You can use your moka pot or espresso machine. Let the ristretto coffee cool before mixing it with the rest of ingredients. Decorate the top with coffee beans. Voila….Your Espresso Martini is ready to be enjoyed! Visit our Mexico Real’s Cafe Blog to learn new coffee recipes like: Tequila Coffee, Cafe de Olla (Mexican Style Coffee), Roman Espresso, Irish Coffee, we have also posts about Mexican culture, and health benefits of coffee!! 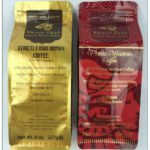 Mexico Real Coffee is an UK online store of Specialty Coffee – Gourmet Mexican Coffee 100% Pure Arabica Altura of Selected Coffee Beans (Cafe de Altura). Altura is the Finest Grade of Mexican Coffee Grown, Altura means “High-Grown”. Mexico Real Coffee was the only Mexican Coffee that Won 2 Stars in the Superior Taste Award by the iTQi. Our Coffee Beans are Artisan Roasted in Small Batches. Mexico Real Cafe Coffee is environmentally friendly farmed and free of pesticides. It grows wild in shade on volcanic soils in the most exotic tropical rainforests next to the coast and nurtured by sea breezes. Mexico Real Coffee has a unique full-bodied flavour, try Mexico Real Coffee once you try it, you will love it! Want To Know The Difference Between An Espresso, Ristretto, Lungo, Doppio Or An Americano Coffee? Kahlo’s Artwork, her Love for Mexican Culture, Mexican Coffee and the Mexican Cuisine.